This is another holiday post, though maybe a little bit of an unconventional one. This is part of my Christmas gift to my brother this year. And why not? 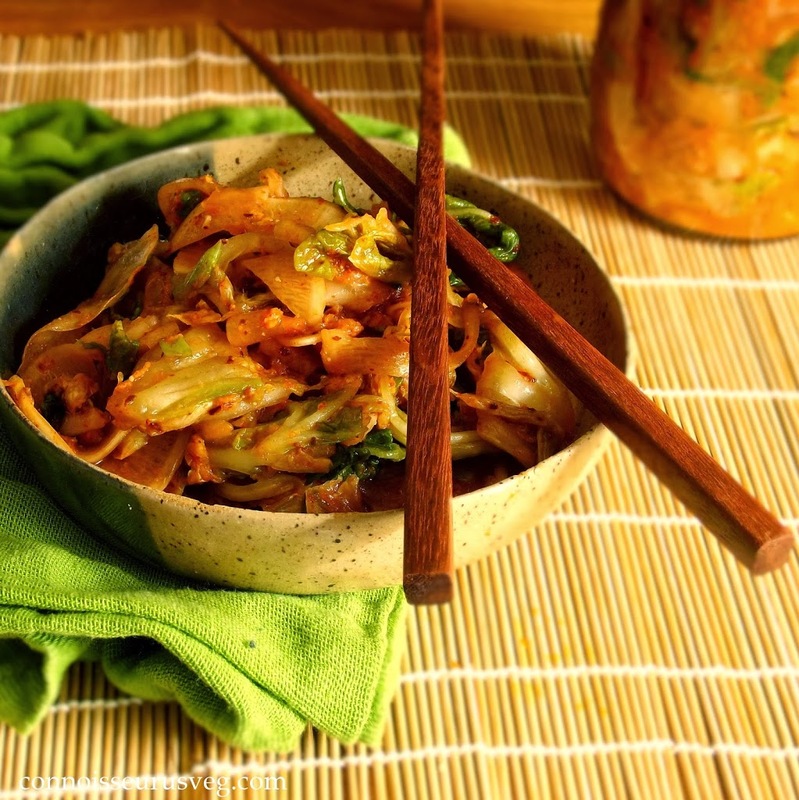 Not everyone is up to the challenge of fermenting their very own homemade kimchi. Really though, it’s not as tough or involves as you might think. I introduced my brother and his then girlfriend, now fiancée to kimchi a few years ago when I cooked up a big pot of kimchi stew at my parents’ house. That version used store bought kimchi. I’m proud to say that nowadays all kimchi based dishes that I cook up involve my very own, homemade kimchi. Anyway, my brother and his girlfriend flipped out over the kimchi stew. So much so, that they’ve requested it on several occasions since, including when they invited me to their place for dinner. I declined and explained that kimchi stew doesn’t travel too well, but fortunately, the main ingredient, kimchi, does! Merry Christmas guys! I figured I’d make a batch of kimchi for my brother and his lady, in the hopes that they can transform it into their very own kimchi stew, which is surprisingly easy (stay tuned) and take advantage of the opportunity to share it with you guys. I’m a big fan of unusual food gifts. I love when I see other bloggers posting soups and baking mixes in jars. I’ve been hoping to get a chance to make some of those myself this year, but time is running short. In any event, I think I’m done with cookies for the year, but I might have a few more tricks up my sleeve for those adventurous gift-givers. If that sounds like you, stay with me. I’ve been in love with kimchi for a while now. My first attempt at making it took place a year or two ago. I honestly don’t remember what recipe I was following, but it instructed me to use an insane amount of chili powder. A half cup? A cup? I can’t remember, just that it was way too much. I enjoy my spicy food, but the most microscopic bit of this stuff placed on my tongue nearly burned my face off. I was so sad. So sad and so desperate, in fact, that I actually attempted rinsing my veggies and refermenting, and guess what? It still burned my face off. This time around, I’d have to create a recipe myself. I cut back on the chili powder and added in some gochujang, a Korean fermented chili paste that adds in a slightly sweet, pungent flavor, as well as some heat. A few tablespoons of miso give this kimchi some added umami. 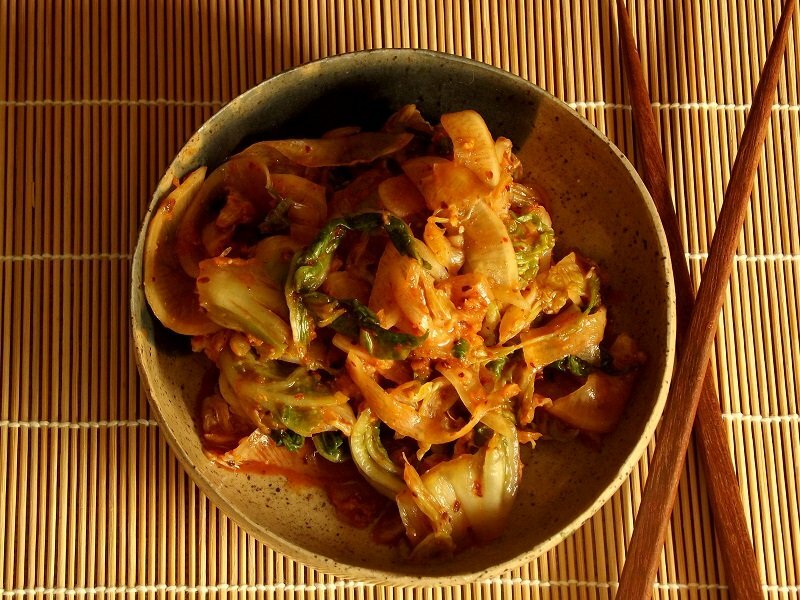 You can play around with the seasonings a bit to your liking, but this recipe yields a medium spicy kimchi, which I think is a good place to start. 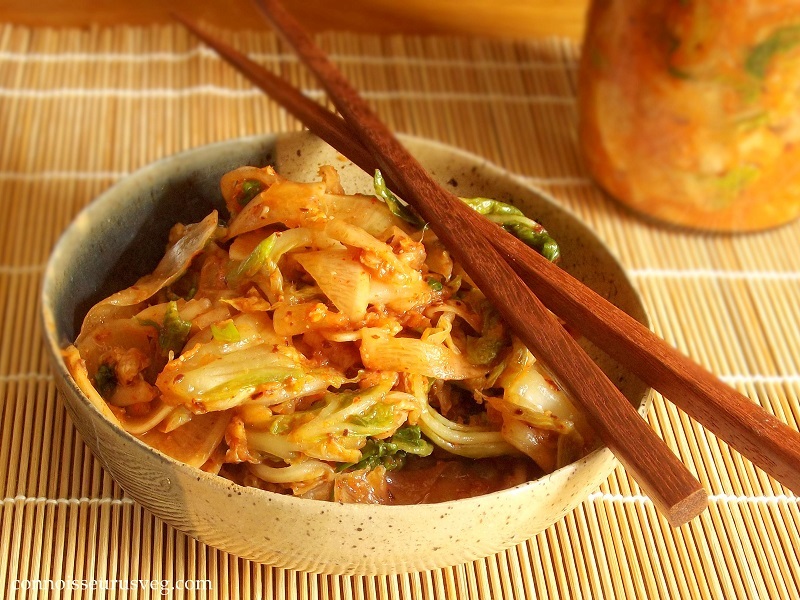 Need some ideas on what to do with your kimchi? You can serve it alongside your favorite Korean dish (or any other dish for that matter). You could also just eat it right out of the jar, which is a habit I’ve gotten into as of late. This recipe for kimchi fried rice with bok choy and tofu turned out fantastic. I have at least one new recipe featuring this stuff coming up on the blog, and if you just read this post, I’m sure you can figure out what that might be for. The ingredients can be easily found in most Asian supermarkets, but just in case you have trouble, I’ve included links to where your seasonings can be purchased on Amazon. Also make sure you’ve got some mason jars on hand, totaling about six cups in volume. Place salt in a large stock pot. Add 1 gallon of water and stir until dissolved. 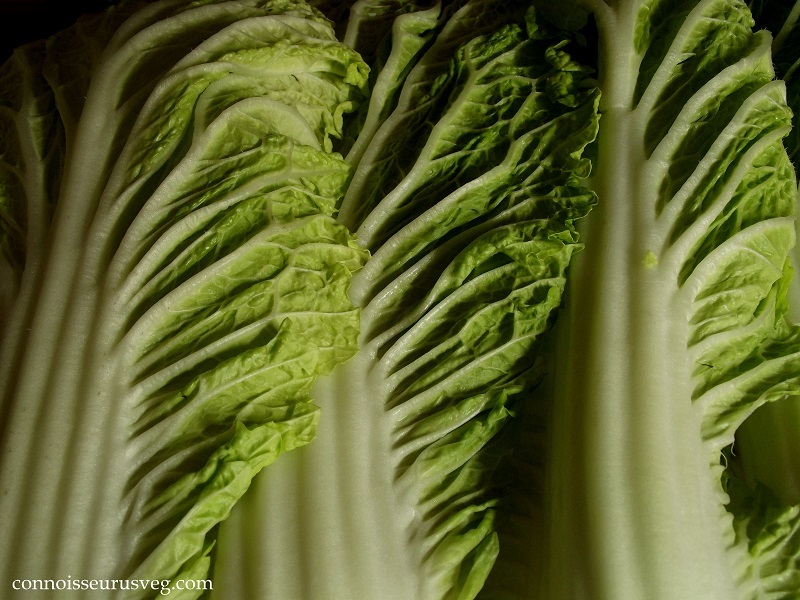 Next, clean and chop your napa cabbage into 1-2 inch pieces, discarding the stems. Place into stock pot and submerge. I like to place a dish over the cabbage to hold it under the liquid. Allow to sit for 1-2 hours. Place garlic, ginger, miso, sugar, gochugaru and gochujang in large mixing bowl and stir until blended. Drain your cabbage and rinse well to remove salt. Place cabbage, daikon and scallions in mixing bowl with seasonings and mix well. You can dig in with your hands to mix it up really well, but please use gloves if you do. Once you've got everything coated, pack into jars, leaving about an inch of head space. Seal jars. After about 24 hours you're going to want to let some air out of your jars. Do this over the sink, roll up your sleeves, and do not attempt this on your way out the door on your way to work. You might take a light shower in kimchi juice and smell like a delightful Korean restaurant all day. I like to place a towel over the jar tops while opening to catch the juices. Reseal jars, and allow to continue sitting, opening periodically to let out more air. 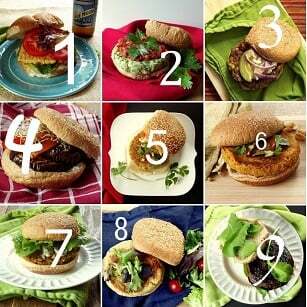 Fermentation takes about 3-5 days total, so start tasting at day 3. When your kimchi is as sour as you want it to be, stick it in the fridge and leave it there for at least one day before eating. Kimchi stays fresh for about a month. This seems like a much more manageable way to make kimchi than other recipes I’ve seen. Thanks for sharing!